ATHLETES WITHOUT LIMITS | Congratulations to our Bike Rack raffle winner! Chuck Harney & Wayne Lurch, co-owners of The Bike Rack, pose with raffle winner Monica Shoenberg. 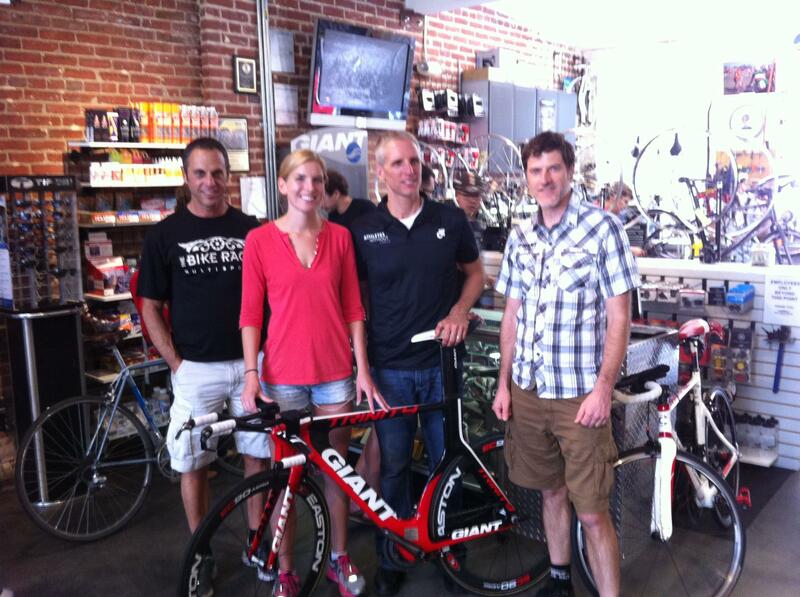 Congrats to raffle winner Monika Schoenberg, the proud owner of a new Giant Trinity, donated by The Bike Rack. Monica is a student at George Washington University, and President of the school’s Triathlon Team. We look forward to future involvement with other students upon discovering Monica’s enthusiasm for supporting athletes with intellectual disability. And thanks to everyone who participated in the raffle at Nations Tri. Because of you and the generosity of The Bike Rack we raised nearly $3000 in just 3 days! This is our seed money to start a cycling program for people with intellectual disability in Washington, DC.